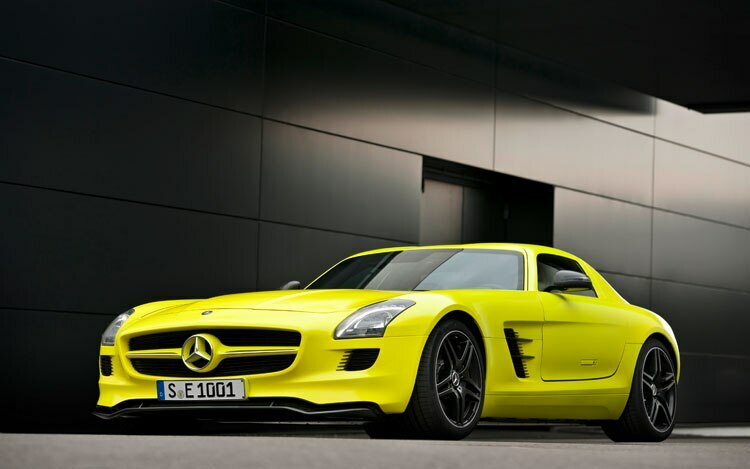 Yes, the all-electric Mercedes-Benz SLS AMG E-Cell Prototype has slightly less horsepower than its gas-powered sibling. But it still has a very impressive 526 horsepower and 649-pound-feet of torque — the latter available from the moment you mash the pedal to the floor. 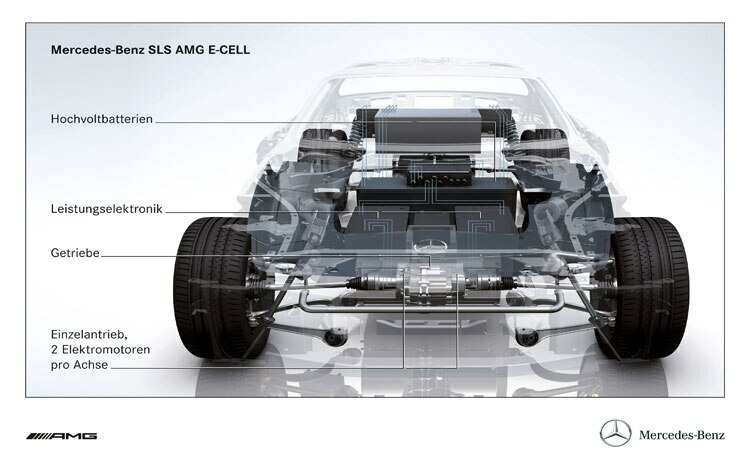 When you do stomp the E-Cell’s accelerator, it will blast 60 mph in four seconds, according to the Benz AMG folks. 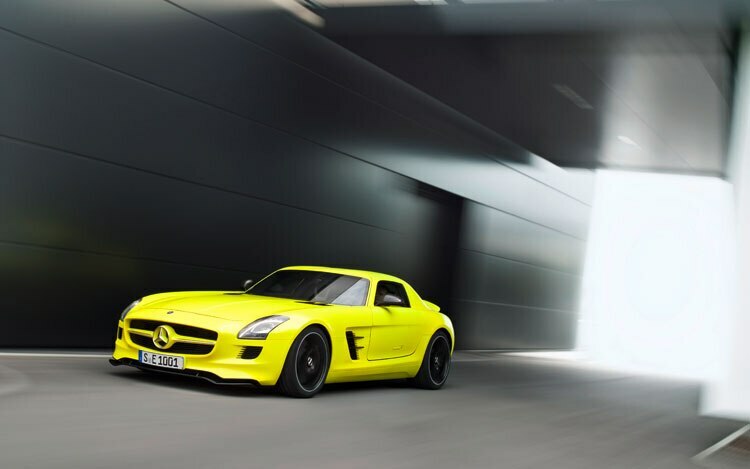 Despite the E-Cell’s impressive numbers, why remove the SLS AMG’s 6.2-liter, 563 horsepower V-8, one of the most sonically rewarding supercar mills in production? It’s all part of Mercedes’ AMG Performance 2015 strategy, the goal of which is to “continually reduce the fuel consumption and emissions of new models in the coming years, while at the same time enhancing the core brand value of performance,” says Ola Källenius, Mercedes-AMG GmbH’s new chairman. 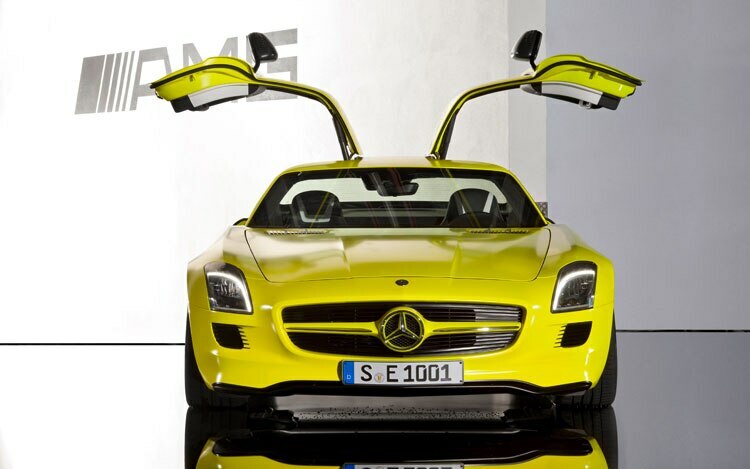 The electric drivetrain allows AMG to place weight efficiently and required no modifications to the SLS’ aluminum spaceframe. The lithium-ion polymer battery modules sit in front of the firewall, in the center tunnel, and behind the seats, aiding in both lowering the E-Cell’s center of gravity and better balancing its weight. The motors, though not mounted on the wheel-hubs, are low in the chassis and close to each wheel. Each motor can achieve a maximum of 12,000 rpm. 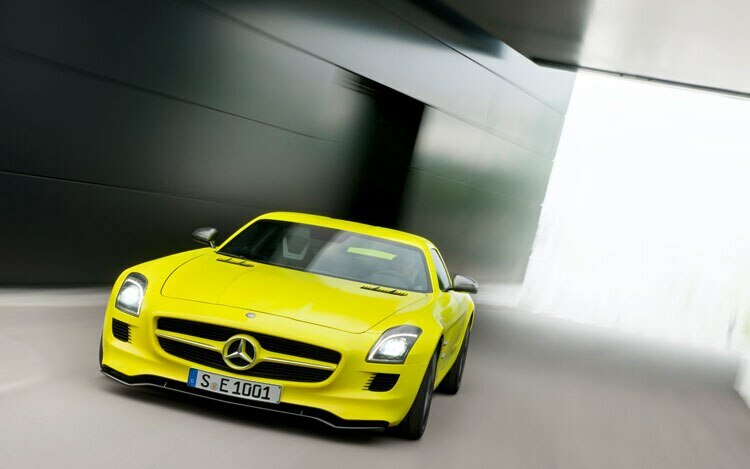 The two motors up front did require AMG to redesign the front suspension. 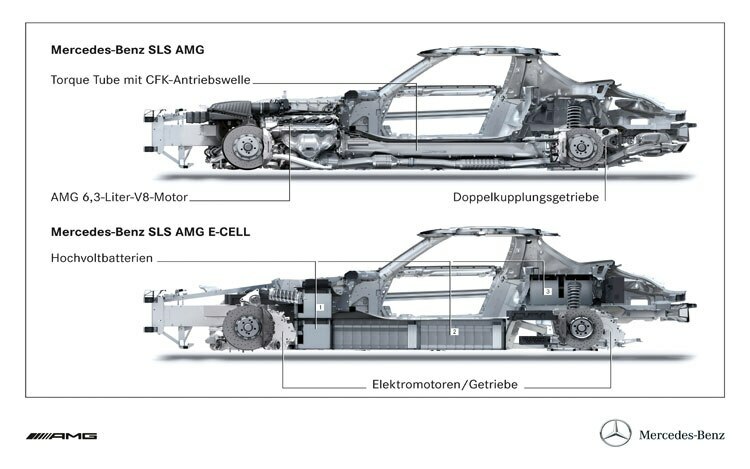 The present SLS has a double wishbone while the E-Cell employs an independent multilink suspension with pushrod damper struts. 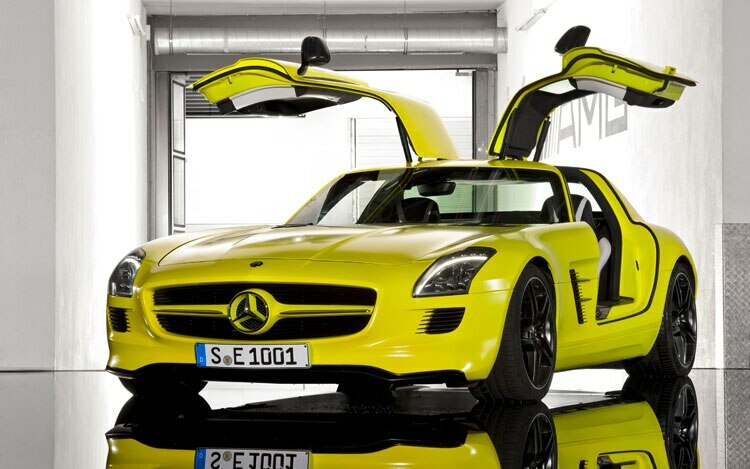 Still, Mercedes maintains that the E-Cell retains the handling characteristics of the gas-powered SLS. 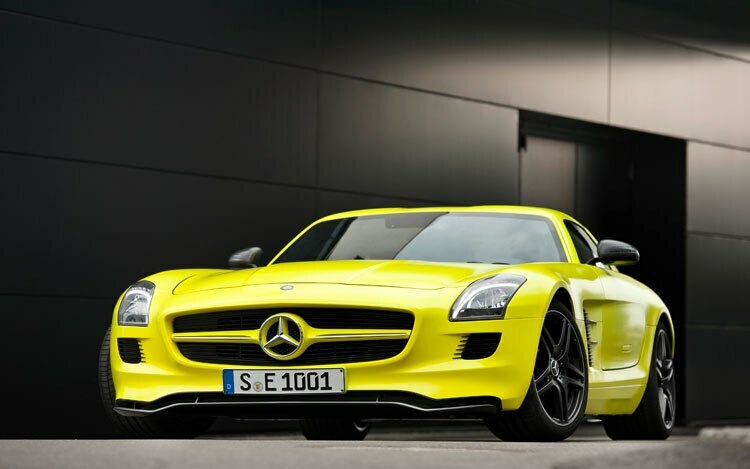 It should sure stop like one: The E-Cell wears the SLS’s optional ceramic composite brakes, sized 18.5-inches front and 14.2-inches rear. The rotors are 40-percent lighter than the standard set of binders, and they also charge the battery during braking. 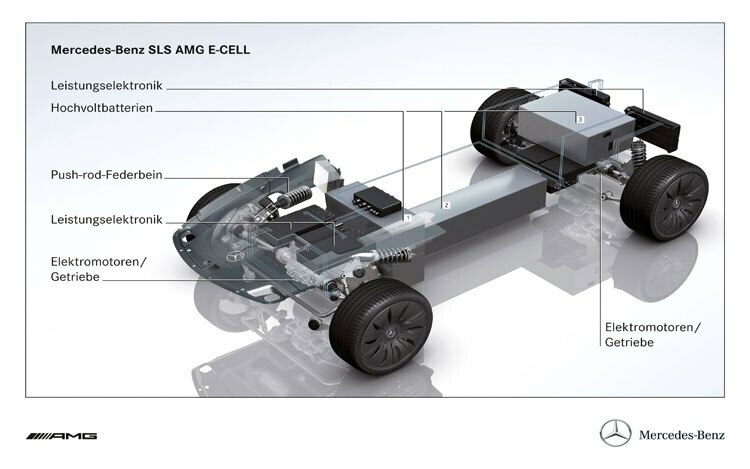 Mercedes says the battery pack’s max load potential is an industry best at 480 kW. Delivering so much power requires substantial temperature monitoring, and a low-temperature circuit cools when need be — the air conditioning can help in extremely hot climates — while, in cold conditions, an electric heater brings the battery up to operating temperature. Two cooling circuits maintain the four electric motors and the power electronics. An extended front apron aids airflow under the body, and Mercedes has also added an extendable front splitter. It acts in parallel with the rear spoiler, extending downward three inches above 75 mph. Air travels faster under the car as a result and reaches a more dramatically angled diffuser — thanks to the absence of an exhaust system — that increases rear downforce. 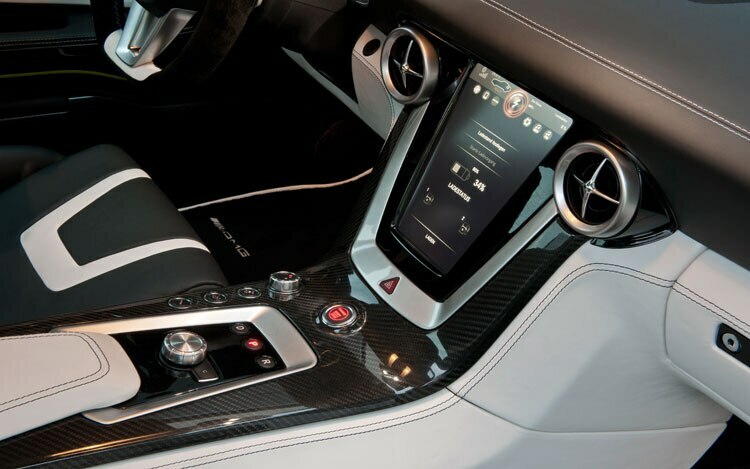 The driver can control the splitter through buttons on the driver-focused AMG Drive Unit, which also houses the start button, rear spoiler control, and new park, reverse, and drive buttons. Additions to the interior include an AMG instrument cluster with displays for speed, charge status, and estimated range. A revised center console features a ten-inch touch screen infotainment system, which operates audio, climate, and navigation functions. The screen also displays the flow of power from the four electric motors. The upholstery is a black-and-white mix of leather and Alcantara on the seats, steering wheel, door linings, and center console. 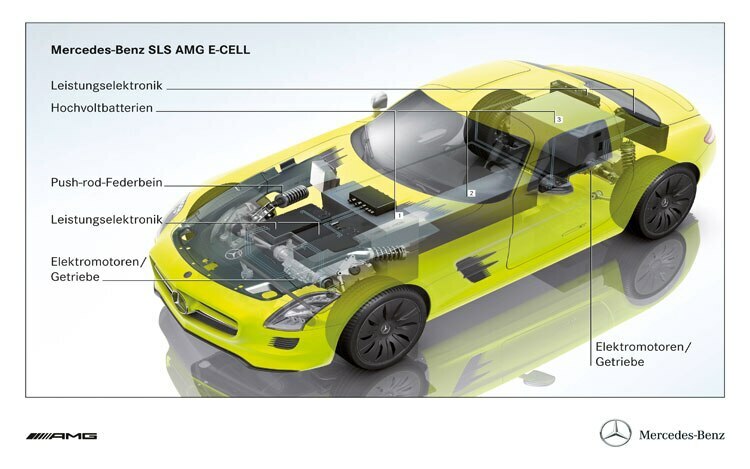 The E-Cell boasts its electric prowess with “AMG lumilectric magno” paint (judges also would’ve also accepted “Wilson tennis ball”). 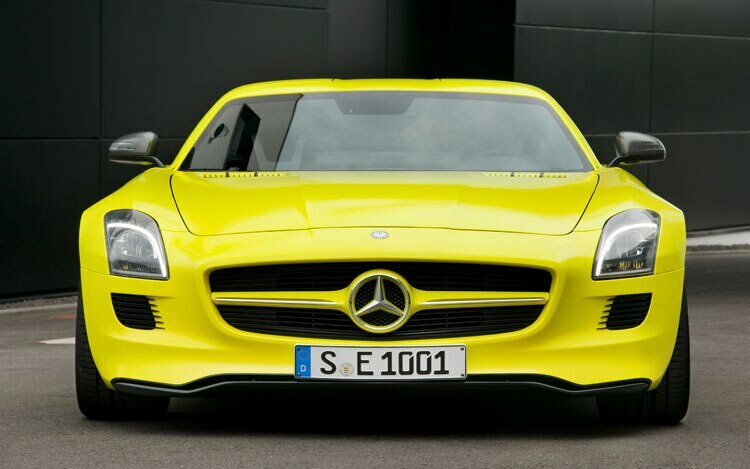 Other exterior additions include LED headlamps with daytime driving lights, a wider radiator grille also with transverse slats, revised air outlets on the hood, and matte black accents where the standard SLS shows chrome or silver. The ten-spoke wheels are staggered 19-inch front and 20-inch rear, wearing 265/35 and 295/30 rubber, respectively. While the E-Cell is a driving prototype — we’ll have our at-the-wheel impressions up shortly — there is still plenty of development work to be done, so specs on range and cost remain to be known. Concrete production details are also to be determined, but expect the E-Cell to be a low volume vehicle. What is promising, though, is the potential for the supercar to live on without gasoline. That, and of course there’s always the natural future comparison between the E-Cell and the Porsche 918 Spyder.